It’s been awhile since I did a review and there are two amazing exhibitions I recently saw in London, the first was the David Hockey exhibition and second is Robots at the Science Museum. 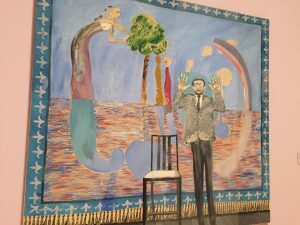 I was fortunate to be able to attend the David Hockney press preview whilst in London. Normally press previews are very nice events that give you time to explore the art without a lot of people and fuss. There is also a few talks, usually from the curator, sometimes it’s the press people. And there is usually tea/coffee and biscuits. This press preview was completely different. It. Was. PACKED. And I mean wall to wall with people writing, photographing and filming. I was able to go through in my normal style, pretty rushed in each room, go back the opposite way and then through again to see what I missed. The problem: normally I go into a room to find just one or two things I like (it something me and Charlotte have always done to avoid art fatigue) but with this exhibition that was impossible – I *liked* everything! 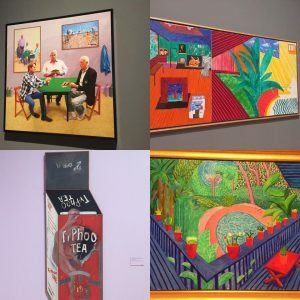 I’ve always been a major Pop Art fan but never really respected David Hockney compared to Peter Blake and Andy Warhol (the shame I know) but he was, for me, under the radar. Until now. 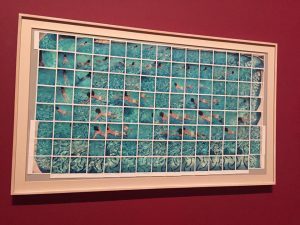 This exhibition is a comprehensive timeline of Hockney’s works. With pieces showcasing his skill in painting, drawing, print, photography and video it’s a real treat to all senses. While the idea is to celebrate his 80’s birthday, the present is to us the visitors to see such skill grow over the years. He started with an iPhone and now continues to work with iPads. The last room of the exhibition shows his digital works which I absolutely adored as he shares him creating drawings – going back, fixing, trying again. 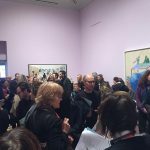 This exhibition is on until May 29th and organised with Tate Britain, the Centre Pompidou, Paris and The Metropolitan Museum of Art, New York (it will travel to Pompidou and Metropolitan Museum of Art). I highly recommend this exhibition – definitely 5 out of 5 stars. See Tate’s website for more information and to book tickets. The tickets are £19.50 for adults but it’s an exhibition that will take you a while to get through.